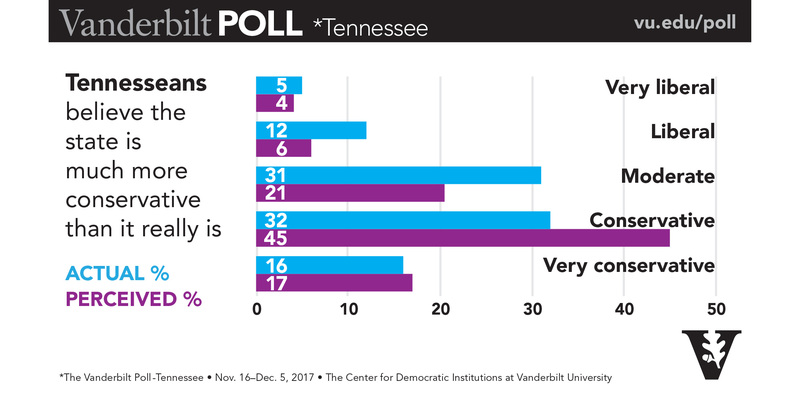 When it comes to their views on public policy, Tennesseans are more moderate than many expect, according to the latest Vanderbilt Poll released on Thursday. These findings, in general, suggest that Tennessee in 2018 could prove to be an important bellwether for the state’s and country’s future—a claim that is consistent with Doug Jones’ surprise win in the Alabama special election on Tuesday, said John Geer, Gertrude S. Conaway Professor of Political Science. 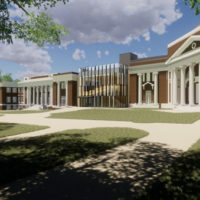 The Vanderbilt Poll is sponsored by Vanderbilt’s Center for the Study of Democratic Institutions, which Geer co-directs with Josh Clinton, Abby and Jon Winkelreid Professor of Political Science. 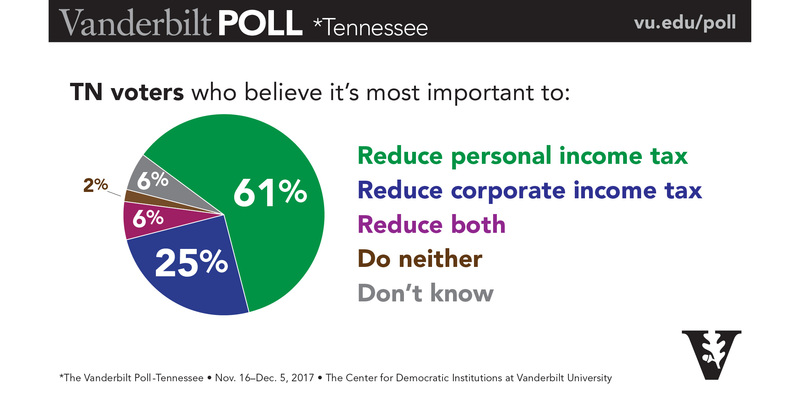 Between Nov. 16-Dec. 5, the poll surveyed a representative sample of 1,013 registered Tennessee voters on a variety of state and national issues. 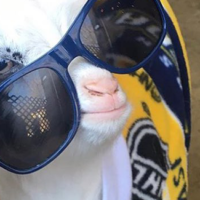 The poll’s margin of error is ±3.7. In other words: There is a 14-point gap between perception and reality. In fact, the state is evenly balanced between conservatives (48 percent) and those who identify as moderate (31) or liberal (17). Using the same rating method above, Tennesseans describe Gov. Bill Haslam almost exactly the same way they describe themselves, which may explain why, with a 63 percent approval rating, he remains the most popular politician in the state by a considerable margin. “Haslam is very representative of what the state is,” Geer said. Approval of President Donald Trump, Sen. Bob Corker, and Sen. Lamar Alexander all dropped a few points since the last Vanderbilt Poll in May, to 48, 47 and 44 percent, respectively. The drop in approval ratings for Alexander and Corker reflect in large part the decline in approval of Congress. Even more notably, President Trump has lost substantial support in Tennessee, dropping 12 points over the last year. Over the same time period, the percentage of Tennesseans who say they believe President Trump is changing Washington for the better has fallen 24 points to 35 percent, while the percentage who believe Trump is changing things for the worse has risen 16 points. In addition, just 39 percent of Tennesseans believe the president tells the truth most of the time. “The broader point is that, for a state he won so handily a year ago, Trump is not overwhelmingly popular here,” said Geer. This finding comports with the upset win in the Alabama Senate race, where Trump campaigned heavily for Roy Moore. 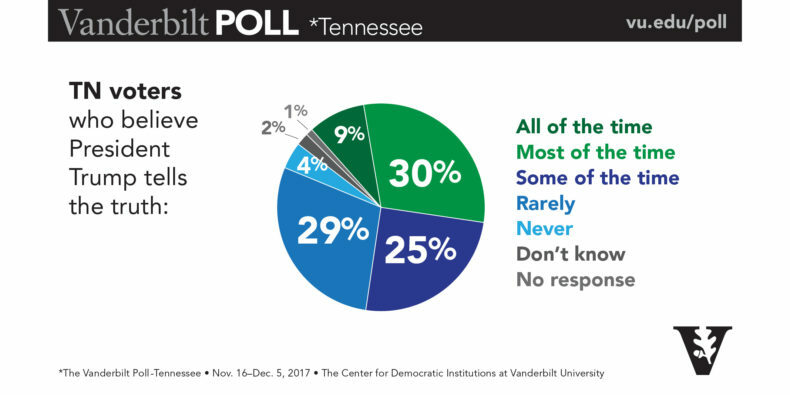 Two-thirds of Tennesseans blame both parties for the dysfunction they perceive in government, and 76 percent say they want their representatives to reach across the aisle in order to get things done—even if it means compromising on some of their own values and priorities. And that’s a preference that transcends ideology. “There are problems in the nation and the state, and people want problem-solvers and solutions, not bomb-throwers and partisan rhetoric,” Clinton said. Republican Marsha Blackburn has the most recognizable name in Tennessee’s U.S. Senate race, at 73 percent, with Democratic candidate Phil Bredesen close behind at 65. 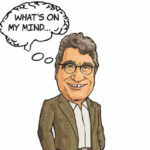 Republican Stephen Fincher trails considerably, with only 22 percent, but does have substantial name recognition in the western part of the state (46 percent). In the governor’s race, Republican Diane Black leads with 59 percent name recognition, followed by Democrat Karl Dean with 41 percent. Republicans Beth Harwell (40) , Randy Boyd (33), Mae Beavers (28) and Bill Lee (14) follow, with Democrat Craig Fitzhugh standing at 10 percent. Health care, education and the economy remain the most important issues for Tennesseans at both the federal and state level, far outstripping immigration, gun legislation, income inequality and social issues as top priorities. Tax reform: The GOP tax reform bill doesn’t align well with what Tennesseans think is important: Just 25 percent believe cutting the corporate tax rate should be a priority, while 61 believe the focus should be on reducing personal income taxes (only 6 percent say both are important). Moreover, only 39 percent believe corporate taxes should be lowered from 35 to 20 percent. Rural hospital closures: Tennesseans believe government has a valuable role to play in ensuring the accessibility of health care. Eighty-five percent of Tennesseans are concerned about recent closures of rural hospitals, and 71 percent—on both sides of the aisle—believe the state should allocate more funding to keep them open. Fifty-six percent believe the federal government should chip in, too. Health care reform: Over the last year, Tennesseans’ views on the Affordable Care Act have shifted considerably. In November 2016, 50 percent of Tennesseans wanted to repeal the ACA or replace it with a Republican alternative, yet now only 35 percent supported those outcomes. Again, much of that dissatisfaction comes from the right, Clinton said. “Remarkably, only 50 percent of registered Republicans in the state now support a Republican alternative [health care plan],” he said. Charter schools: Asked about their opinions on charter schools, 48 percent of Tennesseans say they don’t know enough about them to have an opinion at all. Of those who do, 10 percent oppose them, 20 percent have mixed feelings and 22 percent favor them. Drugs: There is widespread bipartisan consensus that the opioid crisis is a severe issue, with 84 percent describing it as either a major problem or an emergency. Support for legalized marijuana continues to rise, with 44 percent favoring its use for medical purposes only, while an additional 34 percent favor making it legal for both medical and recreational use. Climate Change: In what may be the biggest surprise of the poll, 72 percent of Tennesseans say they believe climate change is likely happening, while 55 percent say there is solid evidence that climate change is responsible for the increase in severe weather around the world. Russia: More than half—56 percent—of Tennesseans believe Russia likely interfered in the 2016 election. Unauthorized immigration: On immigration, Tennesseans have little taste for mass deportations of undocumented immigrants. 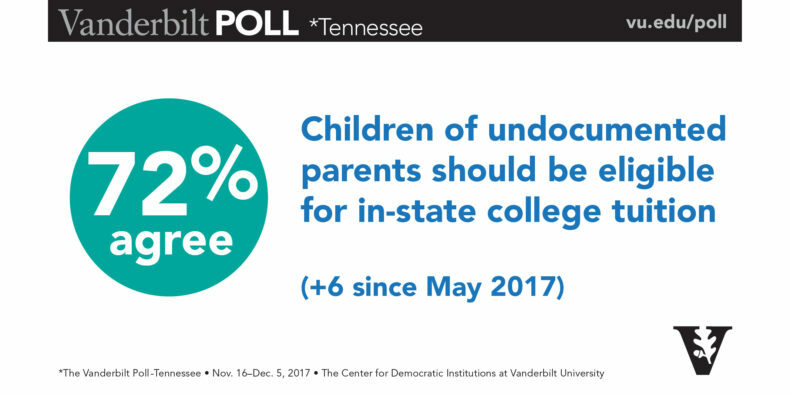 To the contrary, support continues to rise for allowing undocumented immigrants to remain in the country while they apply for citizenship, with three in five Tennesseans now endorsing that approach and the remainder fairly evenly split between allowing them to stay as guest workers and deporting them. Support also continues to rise—up 8 points since May to 72 percent—in favor of allowing these immigrants’ children to be eligible for the in-state tuition rate at Tennessee colleges and universities.